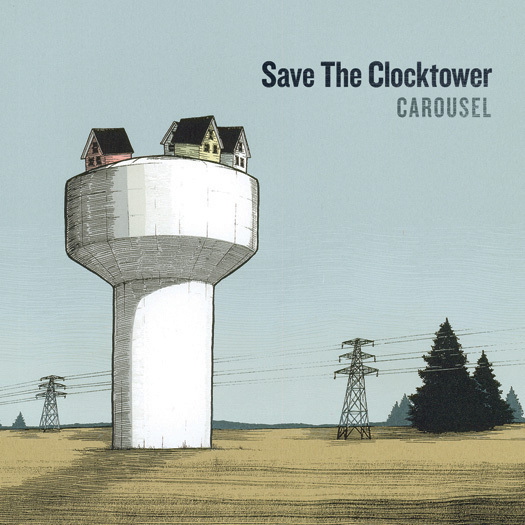 On February 26th Save The Clocktower will celebrate the release of its sophomore album, Carousel, at The Hideout. However, I've already had the pleasure of hearing the newest album from these poppy, electronica-heavy locals. I feel that it's human nature to, upon first listen, liken new bands or albums to more familiar artists or song collections. That is exactly what I tried to do during my first listen to Carousel. However, the list of influences and likenesses that this album embodies seems to never end. Save The Clocktower's brilliant originality lies in its ability to blend an impressive repertoire of preexisting genres and styles with the grace of a much more matured and experienced band. Tracks like "The One Thing" and "Take Me There," heavily laden with synthesized melodies and dance-worthy rhythm sections, would sound right at home in a club setting, but softer, more ethereal songs such as "They" seem best suited for lifting one's spirits on a rainy Sunday afternoon. It's always refreshing when each song that an album holds--in Carousel's case, 10-- possesses distinguishing qualities that allow it to both stand out as a single musical entity and sink in seamlessly amongst the other tracks, staying true to the ambiance and tone of the album. No two songs on Carousel sound the same and yet none of them sound too out of place, either, resulting in an album that will keep listeners on their toes right from the start. This becomes clear during the opener, "Drip," which starts off playful and lighthearted before erupting into an eerily beautiful electronic overdrive. Carousel is truly apt in its title. Passengers of the traditional carnival ride might feel that they're being taken on a whirling journey full of ups and downs, but their voyage is far more controlled than the senses might suggest. Listening to Save The Clocktower's second album induces similar sensations. One might think that the music on Carousel is spiraling beyond its own limits, but the musicians behind this album know exactly what they're doing. At the center of Carousel is an electronically-savvy three-piece with a knack for inducing some serious toe-tapping and the desire to assert themselves as a force to reckoned within Chicago's pop scene. Save The Clocktower have provided Transmission readers with an exclusive free song download. You can get "The One Thing" off of the upcoming Carousel right here. Be sure to follow Save The Clocktower on Twitter for further exclusive offers, show announcements and more. The band plays their record release show Saturday, Feb. 26 at The Hideout (1354 W. Wabansia). The show is 21+ and starts at 9pm. Tickets are $8 in advance and $10 at the door. Ode and Curtis Evans will be opening.